I made this wonderful Lightened-Up Blueberry Coffee Cake using SPLENDA® Brand Sweetener as a part of a sponsored post for SocialStars #SplendaSweeties #SweetSwaps. Lightened-Up Blueberry Coffee Cake allows you to have something sweet with your morning cup of coffee without the guilt. Made with unsweetened applesauce, low-fat milk, SPLENDA® Brown Sugar Blend, and fresh blueberries, it is a satisfying treat that is easy on the waistline. Fresh blueberries provide pockets of sweet and tart flavor, while a walnut streusel adds a little crunch. You can use almonds or pecans instead of walnuts or leave the nuts out altogether. A touch of cinnamon in the batter and streusel adds that quintessential coffee cake flavor. A slice of Lightened-Up Blueberry Coffee is a delicious way to start the day with either a glass of milk or a cup of coffee. It is good warm from the oven or at room temperature. Using SPLENDA® Brown Sugar Blend gives all the flavor of brown sugar to baked goods, but it has twice the sweetness of brown sugar so you only need to use half as much. A 1 bag of SPLENDA® Brown Sugar Blend has the sweetness of 2 pounds of brown sugar. In a recipe that calls for 1 cup of brown sugar, you only need to use 1/2 cup of SPLENDA® Brown Sugar Blend. 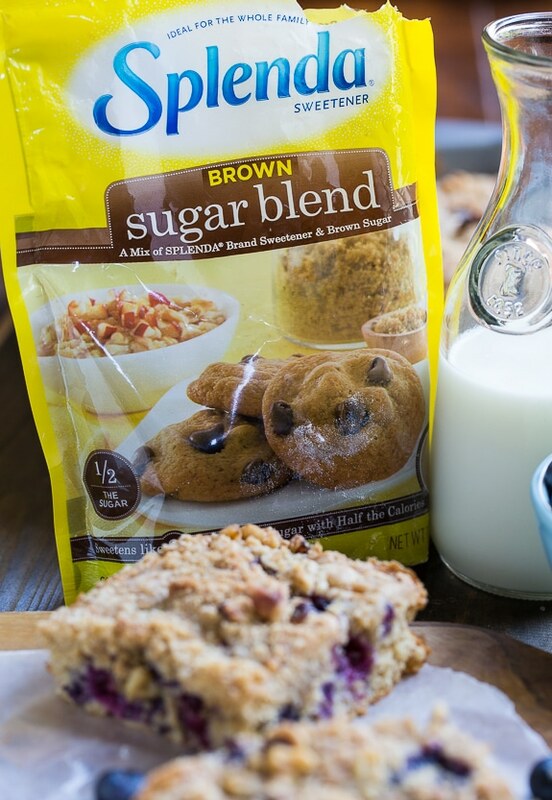 SPLENDA® Brown Sugar Blend gives baked goods a similar texture, moistness, and flavor to using brown sugar. SPLENDA® Brand Sweeteners are versatile and can be used in a variety of recipes including baked goods, appetizers, and beverages. Pretty much any where you want to add some sweetness, SPLENDA® Brand Sweetener can be used. The Sweet Swaps program is dishing out hundreds of ways to save calories by swapping full sugar for SPLENDA® Brand Sweeteners. To learn more about how you can make Sweet Swaps, follow SPLENDA® Brand on Pinterest, Facebook, Twitter, and Instagram. In a medium bowl, stir together flour, 1/4 cup plus 2 tablespoons SPLENDA® Brown Sugar Blend, baking powder, salt, and 1/2 teaspoon cinnamon. In another bowl, whisk together eggs, applesauce, milk, and vanilla extract until well combined. Add wet ingredients to dry and stir just until combined. Fold in blueberries. In a small bowl combine 1/3 cup flour, 3 tablespoons SPLENDA® Brown Sugar Blend, and cinnamon. Cut in butter until crumbly. Stir in walnuts. Scatter mixture evenly on top of batter. Bake for approximately 25 minutes. This entry was posted in Breakfast, Sponsored and tagged blueberries. Bookmark the permalink. 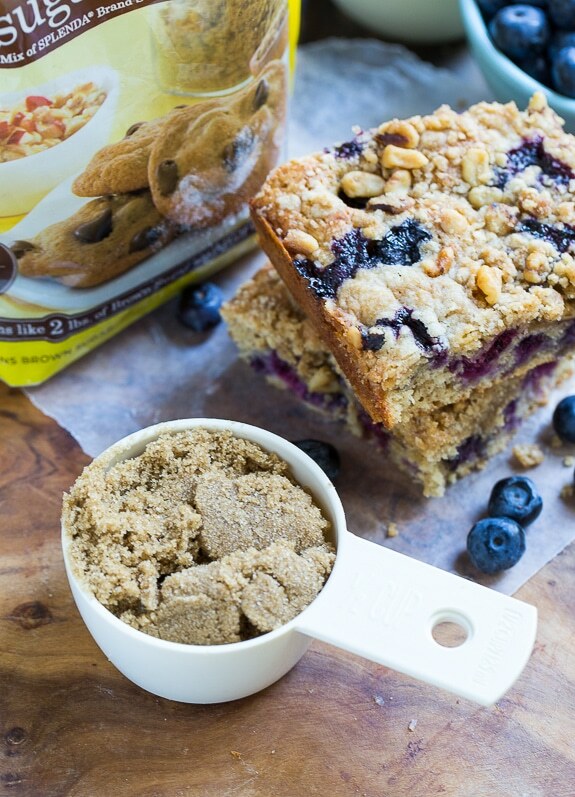 I can hardly stand how ultra-mist and exploding with blueberries this coffee cake looks! And um, the fact that it’s healthy totally means that I can eat half the pan right?! Christin, I had no idea Splenda came in a brown sugar flavor – so thanks for educating me! 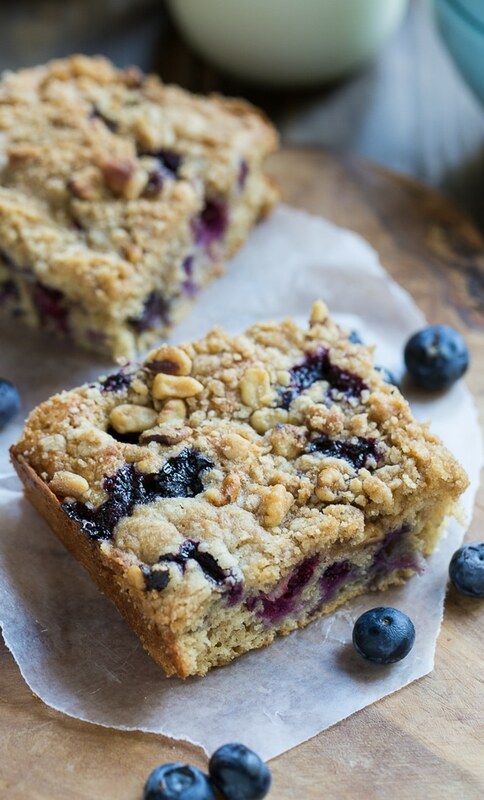 🙂 And, as far as this coffee cake goes…coffee cake is one of my favorite breakfast treats – and with the blueberries… I am so in! This showed up in my feed today and I sent the link to my Mister. It was his day off and he’s been on a baking kick. Came home from work to find it cooling in the counter. It smelled delicious and tastes even better!! Coffee cake is definitely one of my weaknesses! I love that you lightened this up, it looks so perfect. YUM!!! Oh my word! This looks amazing!! What a healthy delicious recipe! Bursting with bright blueberries!! Wow… these photos are next level, I am drooling. Pinning! This coffee cake is beautiful! The blueberries add such a nice freshness, and color, to this! Goodness coffee cake is such a weakness of mine! This looks absolutely delicious – especially with the blueberries (I can’t stop eating berries of all kinds right now!). I adore how you lightened this cake up! It is sensational! Splenda is one of the sugar substitutes that I like to use in baking. This lightened up blueberry cake looks so yummy! I love lightened up desserts!!!! 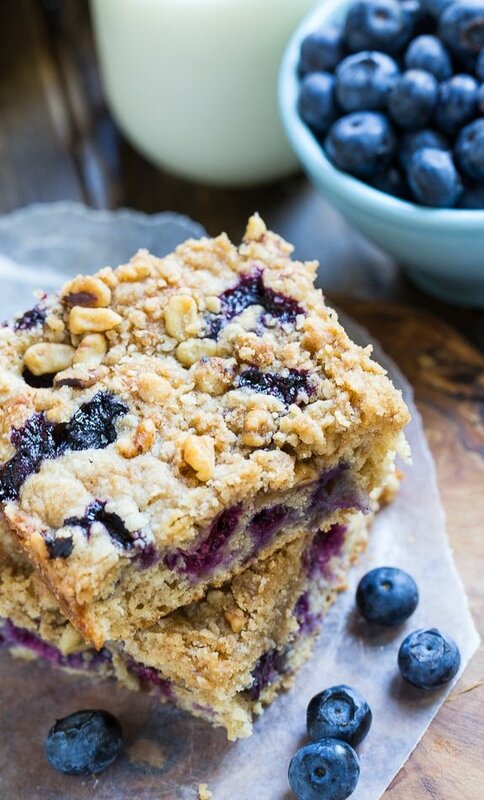 I love baking with applesauce. . this blueberry coffee cake looks amazing!! I love blueberry coffee cake and the fact that this is “lightened Up” makes it so much more appealing! This would be a perfect breakfast cake! I guess since this is lightened up I get two pieces for breakfast — fantastic! This looks delicious, Christin! This coffee cake looks perfect! I can never get enough of blueberry desserts! Love that it’s lightened up too and the Splenda brown sugar blend sounds awesome! I had no idea that splenda made brown sugar, how neat! Coffee cake is so good because it is like a mix between cake and muffins and always tastes so good! 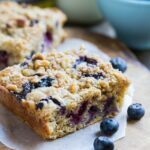 I love the crumbly topping and blueberries are my favorites! Hmmm yum, I can practically smell this delicious blueberry cake! Any cake with a gorgeous crumble topping has my vote! 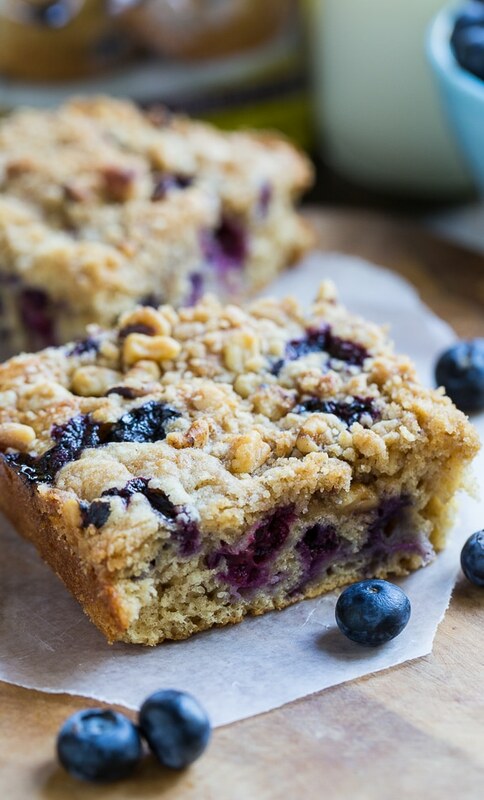 Blueberry coffee cake is my favorite, so I’m loving this lightened up version! And I didn’t know Splenda made brown sugar, I will have to check that out!